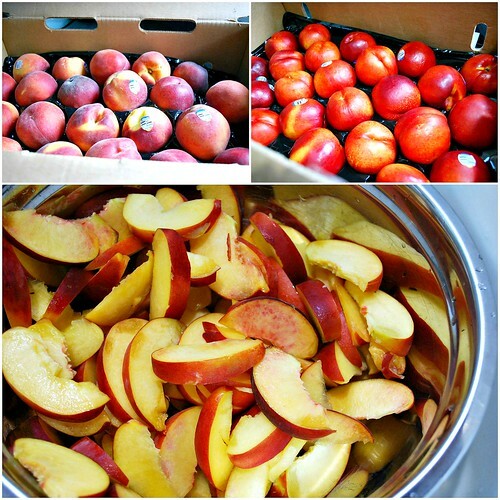 Before things got really crazy with the wedding, I received a generous amount of stone fruit - peaches and nectarines - to play with in the kitchen! As a 'Canbassador' for the Washington State Fruit Commission, I did the obvious and prepped these beautiful stone fruits in a variety of ways - jams, jellies, butter, pancake topping, etc - and I'm excited to be able to enjoy a taste of these delicious gems all throughout the year! If you're interested in canning, check out SweetPreservation.com as a resource for canning and preserves recipes, downloadable jar labels, preservation party ideas and much more. I had so much peach and cherry pie filling made that I canned quite a bit to use for future pies and desserts over the holidays. Canning has been so much fun this summer that I can't wait to do even more next year to capture and keep that fresh taste of summer throughout the fall and winter months. 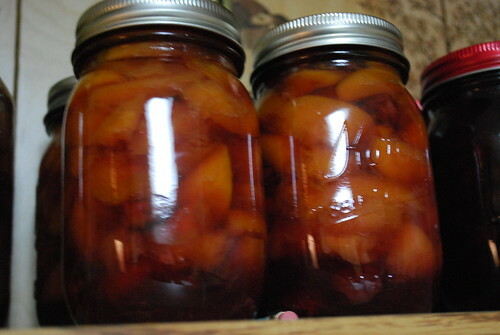 Place whole pitted cherries and peaches in a dutch oven and add pectin and butter. Bring to a boil over high heat, stirring constantly. Stir in sugar and almond extract, return to a full boil. Boil and stir for 1 minute. 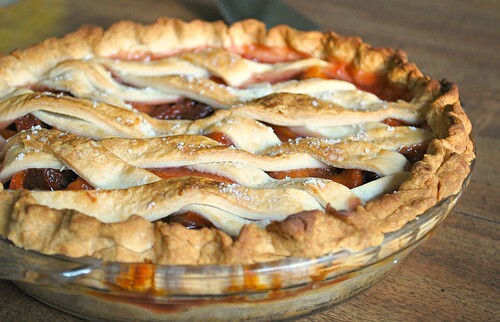 Preserve the Peach & Cherry Pie Filling immediately, using 1 of the 3 ways listed here. Roll 1 (9-inch) dough portion into an 11-inch circle. Fit dough into a 9-inch pie plate coated with cooking spray, allowing dough to extend over edge of plate. Spoon peach & cherry pie filling into prepared pie plate. Roll remaining (9-inch) dough portion into a 12-inch circle. 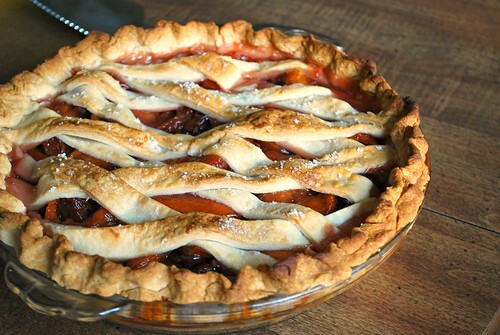 Cut dough into 12 (1-inch-wide) strips; arrange in a lattice pattern over cherry mixture. Fold edges under; crimp. Combine 2 tablespoons water and egg white in a small bowl. Brush the egg white mixture over dough on top of pie, and sprinkle dough evenly with 2 tablespoons turbinado sugar. Bake at 400° for 20 minutes. Shield edges of piecrust with foil, and bake an additional 40 minutes or until crust is golden brown and filling is thick and bubbly. Cool pie in pan for 45 minutes on a wire rack. Washington State Fruit Commission is a growers’ organization funded by fruit assessments to increase awareness and consumption of regional stone fruits. The organization is dedicated to the promotion, education, market development, and research of soft fruits from Northwest orchards. It began in 1947 and has since grown to include five states – Washington, Oregon, Idaho, Utah and Montana. 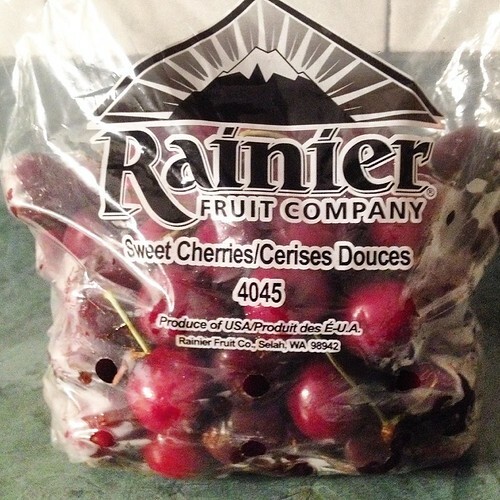 For more information, visit www.nwcherries.com or www.wastatefruit.com. This looks amazing! I have never actually made a pie. Maybe this fall will be the time!